Wait, whoa, did I just write "premium" ice cream cup? Funny, since premium usually implies high fat content. Maybe I should start at the beginning. I ran into Walmart to get just a couple of things but as I went through the store I really started to want chocolate ice cream. The diet is still going well after three weeks, I'm half way through my goal (I'm down to +6) so I'm really trying to run with the whole calorie counting thing. 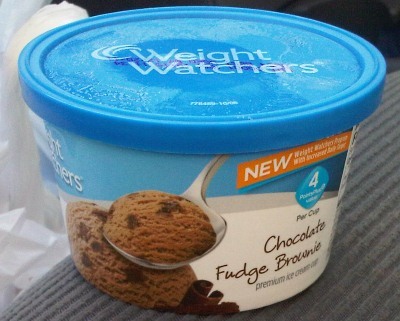 So rather than pick the 250-300+ calorie treats, I spied some weight watchers in it's new white and light blue packaging. Nothing fancy, but it does look modern. I check the back and it's a mere 150 calories with only 15 from fat. Sweet, sounds like no guilt to me. Offhand that picture makes me expect something like Edy's Double Fudge Brownie Fun Flavor, so let's find out. Well, ok then. I was expecting a seal on the inside since there wasn't one on the outside. Looks pretty airy like most light ice creams, and I see a few brownie bits. This may not be so bad, let's see what $1.22 gets us. OH MAN, this is terrible, just terrible. The chocolate is terrible. The ice cream itself doesn't seem to be the problem (for a light ice cream), but ewww. Something ain't right. I wonder if they tried to improve the flavor but it backfired. I'm sorry I can't be more specific, I just don't like it. Let's put it another way, I cracked this bad boy open in the walmart parking lot and there was a gas station across the street. I took a few bites, drove across the street, took a few more bites, and then tossed the second half in the trash. There was only about 75 calories left, but I'd rather just not eat it. You'd think I would have had the opposite reaction, but not so much. I'm good, thanks for playing, bu-bye. your review could've just been the last two paragraphs of your post. those two said it all. i have seen a very nice post. i really like this post. 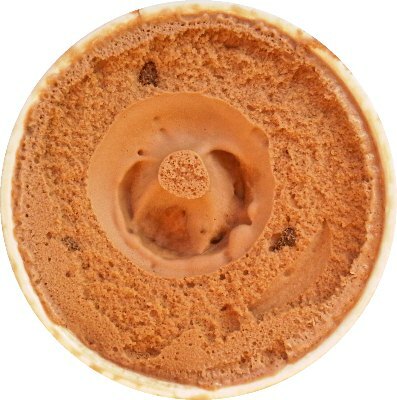 This post gives us very good knowledge about chocolate fudge brownie premium ice cream.